The City of Calumet City was founded in 1896, and has a population of almost 40,000 residents. The City of Calumet City is located just south of the City of Chicago. 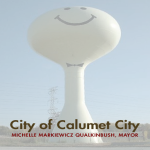 The Official Calumet City iPhone app is your portal to learn more about the City, as well as report service needs, as well as staying up to date on important City information.